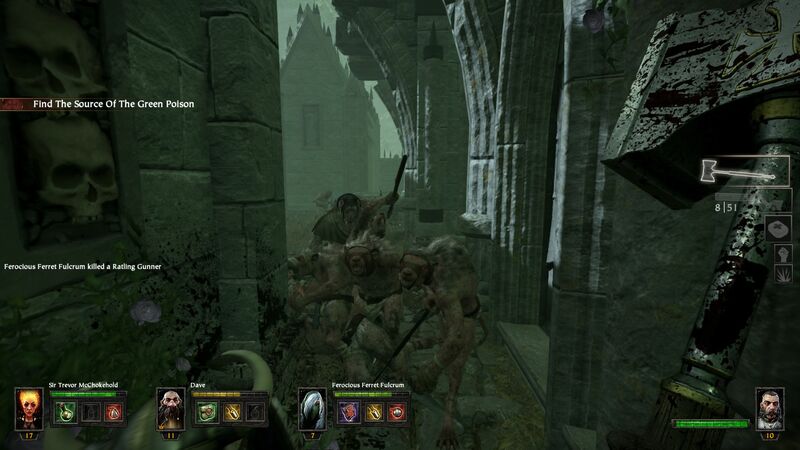 It’s a little unsettling how on-the-nose Vermintide is as a copy of Left 4 Dead. It’s been seven years since the original L4D was released, and while I’ve played plenty of games that have put their own spin on the four-player co-op concept (Payday and Killing Floor come to mind), none of them have followed quite as closely in its footsteps as Vermintide does. You’re one of a party of four heroes trapped in a city that’s been overrun by the Skaven – odious little rat-men who swarm you in huge packs, and who thus serve as admirable stand-ins for the zombies. From the inn that serves as your base of operations you can pick one of a selection of thirteen missions to attempt to foil the Skaven assault; each of these missions makes a fairly spirited attempt to mix things up a bit, but ultimately they each boil down to carrying out an objective while fending off wave after wave of Skaven, just like L4D’s panic events. Individual Skaven are easily slaughtered, but they outnumber you ten to one and have the help of four different types of special Skaven, three of whom are broadly analogous to the original special infected in L4D. There’s an AI director governing when the game is going to drop a Rat Ogre (read: Tank) on you, expendable bombs that you use on big hordes or tough enemies, medpacks (sorry, medical supplies) and pills (healing potions) – the list of similarities goes on and on. If this were everything that Vermintide is, I’d be pretty quick to call it a barefaced rip-off of L4D and move on to the next thing. 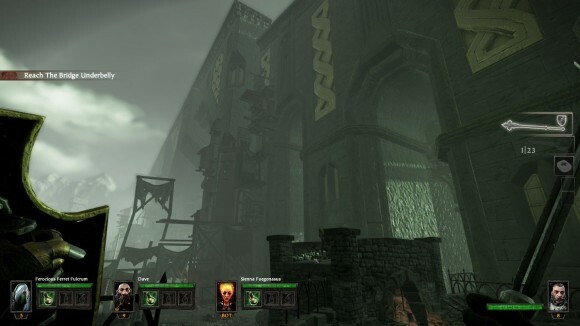 Fortunately, while Vermintide does have a surprising amount of L4D’s DNA lurking inside of it, it’s eschewed resting on L4D’s laurels and instead uses this as a strong base on which to build new and interesting mechanics, and these changes do more than enough to comfortably distance it from its ancestor and lend it oodles of its own character. 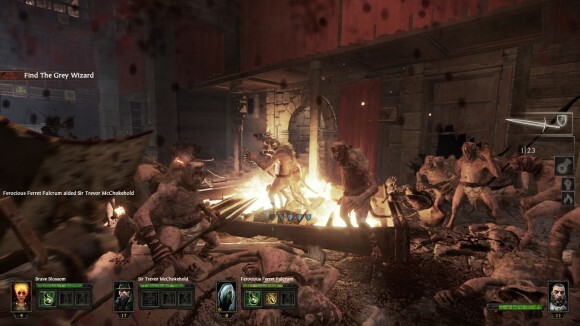 Probably the biggest mechanical switch-up is that Vermintide is primarily a melee-focused game – where L4D had you keeping the zombies as far away from you as possible, you *have* to close with the Skaven hordes in Vermintide because ammo for ranged weapons is scarce and you can’t possibly use bows and muskets to deal with them all. Developers Fatshark have plenty of previous experience in multiplayer medieval combat as they were responsible for the ill-fated War Of The Roses1, and that experience shows through in Vermintide’s viscerally violent virtual rat slaughterhouse; the melee combat here is as satisfying as anything in Chivalry, and certainly far more so than the comparatively anaemic melee weapons in L4D2. Heads pop, necks get sliced, and the two-handers can cleave through five or six ratmen at once. Of course there’s twenty more rats right behind them, and so Vermintide’s melees can turn into surprisingly intelligent affairs as you attempt to manage the teeming mass of skaven that’s coming for you: you have to get up close and personal to kill them, but you also have to do it without losing too much health in the process. 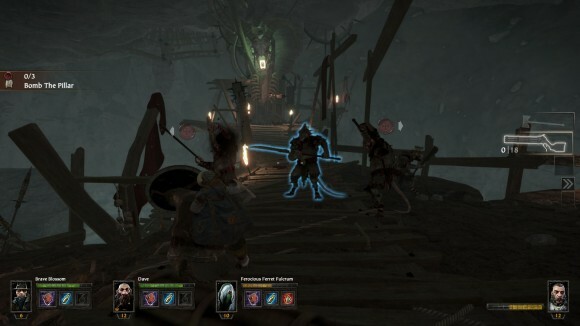 You can block, and if your connection is good enough you can stop mid-swing to raise your guard when you see a skaven in front of you winding up for an attack, but blocking uses stamina and you can’t keep your guard up indefinitely. This is where the third basic element of melee comes in: pushing. Attacking while you’re holding block will result in your character giving anything in front of it a meaty shove, which does no damage but sends rats sprawling back and creates space for you to work on actually killing them two or three at a time. Pushing also uses stamina so you have to break it up with attacks, and so defending against a horde attack is a matter of using blocks, pushes and positioning to prevent yourselves from being surrounded and dragged down while you thin out their numbers sufficiently to move forward. 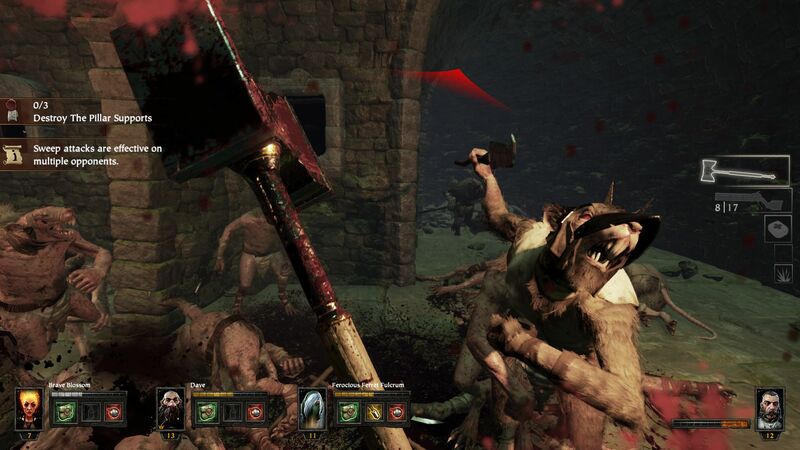 Slaughtering skaven in Vermintide is perpetually satisfying and quite easy to sustain once you get into the rhythm of it; there is a reasonably high skill ceiling involved, but if you pay attention and fight smart you can weather entire waves of skaven without taking so much as a scratch. Unfortunately for you the lesser skaven are just a smokescreen for the far more dangerous special skaven types; while you’re dealing with a horde you’re much less likely to be able to notice them sneaking around in the back lines until they launch their attack, at which point it’s far, far too late. There’s four basic types: the Gutter Runner, who is a direct copy of the pouncing Hunter from L4D; the Poison Globadier, who hurls vials of deadly poison gas that damage anyone caught in the blast radius (including skaven) and block vision; the Ratling Gunner, who is an armoured rat with a minigun; and the Packmaster, who snags unwary heroes with a mancatcher and drags them off to the far reaches of the level. Of these only the Packmaster is truly dangerous on his own, and then only to players who have become separated from the rest of the group, but when you thrown any of these special skaven in with a horde they become so much worse. A horde can cover for the Packmaster’s approach, and once he hooks somebody the horde will close in around him and make rescuing them a lot more difficult since you now have to cut your way through a crowd of angry skaven. Globadiers disorient players they hit and can temporarily split a party up with their gas to make them easier picking for other skaven, and the Ratling Gunners take a while to set up for an attack but can wipe out a player’s entire health bar if they don’t get into cover pretty sharpish. One of these specials is bad enough; encountering two or more at the same time as a horde is potentially game ending if you don’t spot and eliminate them quickly. Vermintide also has a fifth type of special skaven: the Stormvermin. These aren’t lumped in with the rest of the specials as you’ll mostly encounter them sprinkled in with the basic clanrats infesting a level rather than spawning off on their own and beelining for the party. Stormvermin are bigger, tougher rats armed with glaives that can take off a quarter or more of your health bar in one swing, and armoured so that they’re immune to basic player attacks. For Stormvermin you have to aim for the head, or else use an attack with the armour-piercing property; nothing else is going to cut it. They’re mostly used to beef up the skaven ranks and keep the party on their toes (you can’t just run around assuming your basic opposition is going to be cannon fodder with them in the mix) but you’ll also occasionally encounter six-rat patrols of Stormvermin marching through an area. Fighting six Stormvermin at once is really dicey unless you’re loaded with bombs, so it’s best to avoid them completely if you can. Special skaven like the Stormvermin often require special weapons to eliminate them efficiently, which makes this a great time to talk about the other thing Vermintide does that separates it from the basic Left 4 Dead experience: its class and loot system. 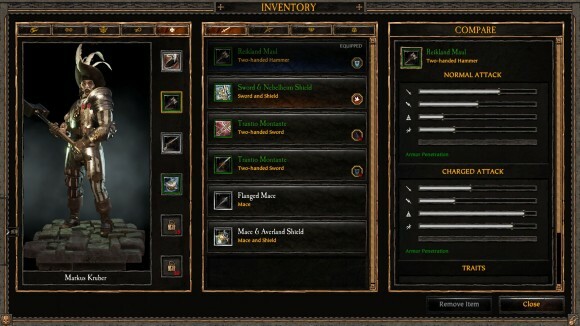 Unlike L4D, where each of the survivors played identically to one another, each of the characters in Vermintide has access to a very different set of weapons, which affords them each a very different set of abilities. The Empire Soldier and the Dwarf Ranger share a fair amount of overlap; each of them gets access to shields, two-handed weapons and black powder firearms. The Dwarf is a little more defensively focused, being happiest when he has a shield and axe/hammer – the shield affords bonus stamina for blocking/pushing and makes pushes more effective as you bat skaven backwards with your shield — and the Soldier is best with his two-handed hammer, which can smash hordes aside and goes straight through Stormvermin armour, but they can each play the other’s role if they have the the right equipment. The Witch Hunter is another melee-focused class, but one played with much more finesse: his basic loadout is a rapier, which will slice heads with a light sweep and pierce armour with a charged thrust, but which is much less effective if you’re not great at aiming for the neck or head. The Elf Waywatcher has access to a variety of bows with plenty of ammo, but is also surprising good at blending skaven with her twin swords/daggers – she just has next to no staying power compared to the other characters and is basically the dictionary definition of “glass cannon”. Finally there’s the Bright Wizard, who gets a paragraph all to herself because she has a mechanic all to herself: heat management. She gets a basic melee weapon like the rest, but this is only a backup to her magic staff. There’s several different types of staff available, each of which has a different basic and charged attack – a beam, a fiery bolt, a fireball to blast whole groups of skaven at once — but all of the wizard’s attacks generate heat instead of using ammo. If she generates too much heat she explodes, so she can’t spam fireballs indefinitely; once she reaches her limit she has to either switch to the backup melee weapon while she cools off – and she’s far less handy in close combat than the rest of the party — or else has to spend time manually venting the excess heat; this is faster, but she’s practically immobile while she does it and can potentially take damage while venting if she’s hugely overcharged with heat. The staff attacks are very powerful and some of the best crowd-control methods in the game, but the heat mechanic ensures the Wizard has to pick her targets same as everyone else; if she’s just spammed fireballs to take out a dozen clanrats it means she won’t have anything left to deal with the two Stormvermin who just showed up without bursting into flames herself. There’s a fair quantity of equipment available to each character; I’d say each of them can equip at least seven or eight different melee and ranged weapons, and each of those weapons is very different from the others. For example, the Soldier’s ranged weapons consist of a blunderbuss (shotgun that blows away anything directly in front of him, but a bit redundant when he has the hammer), a repeater rifle (longer range, fires quickly and pierces multiple targets making it good against clanrats, but does comparatively little damage and is pretty useless against specials), and an arquebus (very long-range one-shot sniper rifle made for headshotting specials, but absolutely useless against hordes). The weapons give each of the classes certain options in combat, and by coordinating their equipment choices and working together in their chosen roles a party can be far more effective and actually stands a chance of making it to the end of the level on the higher difficulties. But how do you get those weapons in the first place? 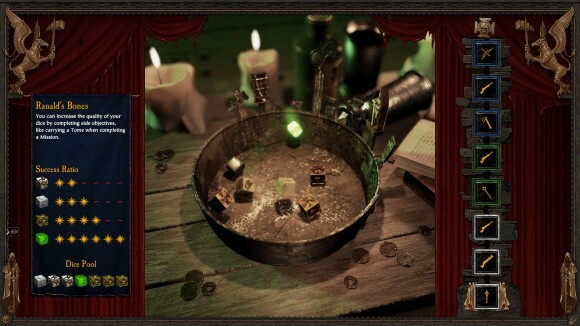 Each class starts with a modest selection available, but you have to unlock the rest as you play the game, which brings me to the best (and worst) innovation Vermintide has to offer: its loot system. In its most basic form, when you make it to the end of a mission you roll seven dice, each of which has two successes and four blanks. There’s a seven tier loot table with basic white items at the bottom and more powerful green, blue, and even orange items at the top, and each success you roll on the loot dice moves your reward ticker from the bottom towards the top of the table. Each mission successfully completed is guaranteed to give you one piece of equipment (as zero successes will still yield a white item), while the dice roll determines how good that equipment is. Completing a mission on harder difficulty levels improves the basic loot tables, with orange Legendary items inching into the top of the table on hard and appearing at progressively lower tiers on Nightmare and Cataclysm, with less successes required to obtain them. So far, so simple. 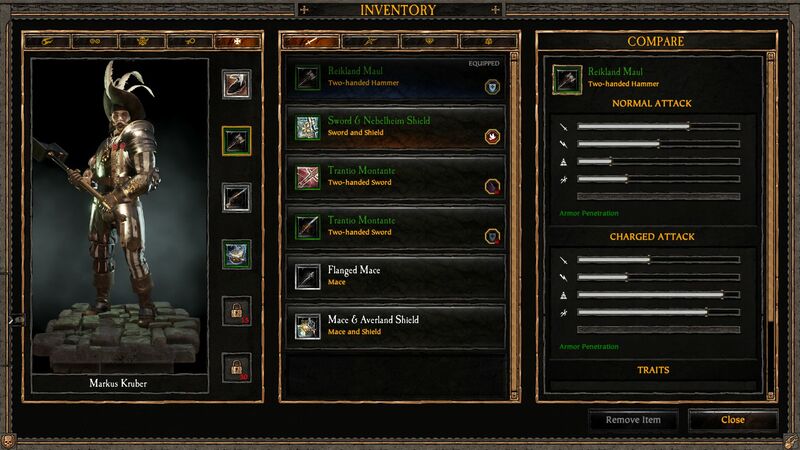 Now for the really clever thing Vermintide does, though: while a harder difficulty level improves the quality of the basic loot table, there are items scattered throughout the longer missions in the game that replace your basic loot dice with better ones that are more likely to yield a success. Each of these is also a handicap in some way; for example, you can pick up Tomes on your way through a level that replace your healing item (which is obviously a little awkward), but each Tome that you successfully carried to the end rewards you with a dice that has four successes instead of the basic two. Grimoires take up your powerup slot and reduce your entire party’s maximum health by 25%, but yield dice that are a guaranteed success should you manage to exit the level carrying one. Finally – and most diabolically – you’ll occasionally see a rare type of special Skaven called a Pack Rat wandering around a level. He’s pretty tough, and as soon as you attack him he’ll try to scamper off somewhere out of sight where he can despawn, but if you manage to bring him down he’ll drop the contents of his loot sack which can contain one or more Cursed Loot Dice. A Cursed dice only has three successes on it, but this is often enough to cause one or more party members to lose all sense of logic or reason and pursue the Pack Rat single-mindedly through the level2. This usually results in them triggering a horde that the party is out of position, which in turn results in the party getting murdered by specials. And if you die? Well, a failed mission means you don’t get to roll for loot at all, so all of those dice you just wiped the party to get were totally wasted. I really like this system of taking voluntary handicaps in order to improve your chances of a good item at the end of the level; it’s a great risk/reward choice for the party to have to make, and encourages exploration of the levels to ensure you haven’t missed any extra bonus dice that might have been lying around. The loot system itself gives Vermintide a fair bit of replayability beyond simply completing all the missions – it’s perfectly fun to play on its own, but just as with Diablo it’s nice to have a long-term goal of better equipment to shoot for. However, it’s not all good news; for starters the loot tables are randomly generated and can yield any item for any character, which makes it a little tiresome when you spend 90% of your time playing the Soldier and you pick up your seventh pair of Waywatcher daggers. There is a lot of RNG involved despite your ability to improve the odds by picking up Tomes etc., and this is compounded by the higher difficulty levels all but requiring better-quality items in order to be effective; like I said before, the skill ceiling is fairly high and Hard is perfectly doable with white Common items as long as the party is sensible about it, but Nightmare is pretty much impossible without a decent set of greens; when even the basic clanrats take three or four hits to kill you’re going to get overwhelmed in fairly short order. 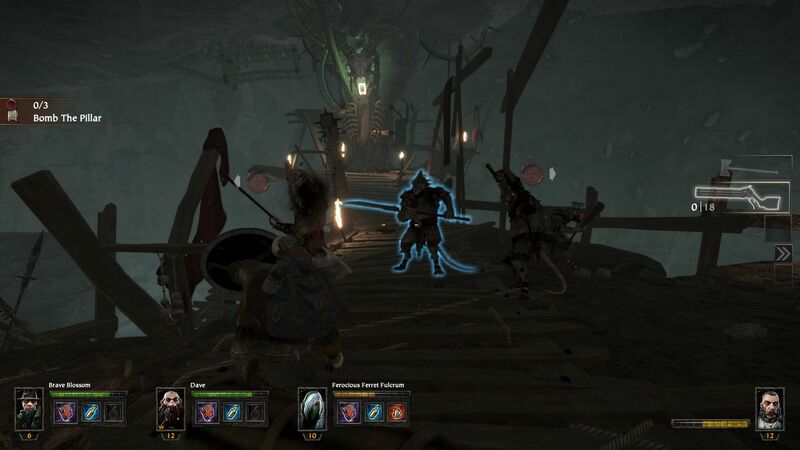 I would hope this is an area that Fatshark pay attention to once they’ve smoothed over some of the rougher edges Vermintide has – the loot system has some fantastic ideas, but I have serious doubts about its long-term viability3. Lastly I should talk about the missions themselves, and the use of the Warhammer Fantasy setting as a whole. There’s thirteen missions in Vermintide, split roughly 50/50 between short missions that are completable in 15-20 minutes and more gruelling variants that take 30-40 minutes to finish. Most of the short missions spawn you into a relatively open area where you’re shown 3-4 objectives scattered about the level and left to get on with it; this can be anything from gathering gunpowder barrels and carrying it back to a ferry to smashing pillars to bring down the building sheltering a rat warren. By contrast the longer missions are much more like Left 4 Dead: you travel from point A to point B while fighting lots and lots of rats; when you get to point B you do some objective whilst under pressure from waves of skaven and specials (as with the short missions this usually involves gathering gunpowder/wheat or smashing breakable items), and then you run to the escape vehicle. Vermintide recycles its basic mission objectives in several different contexts, and I think this would wear pretty thin if the levels themselves didn’t have a few tricks up their sleeves in terms of design. The Wizard’s Tower is a particular standout here and does some really clever things with player perception, but the rest of them make a valiant effort to change things up in terms of setting and pace, from making the players run to the escape vehicle through a collapsing tunnel filled with enraged skaven to taking the unusual step of adding a point C in after completing the objective/horde event at point B. Visually it all looks pretty good and has some spectacular moments that are intended to impress; the palette is a little dull for my tastes, but it is set in the End Times variant of the Warhammer setting so I’ll accept it tending towards the grimdark end of the spectrum. And that’s Vermintide. Loot system aside there are only two further criticisms I can reasonably make of the game. First is that the general netcode is mostly solid, but it still seems rather rough around the edges in places; Skaven specials have the occasional tendency to teleport around the map as the game updates their position, which is unsettling bordering on downright annoying, and while I hear it’s possible to bat a Gutter Runner away mid-leap I’ve never managed it because it requires split-second timing based on the Gutter Runner’s position that the netcode just isn’t up to providing. Second is that it deals with host migration terribly, which is to say that it doesn’t deal with host migration at all. If the host leaves, crashes, or otherwise drops from the game it’ll kick the rest of the players back to the start of the level, which is absolutely infuriating when you’re in the middle of one of the longer missions. This is not something that I should be experiencing in a videogame made in glorious space-year 2015. And finally the usual co-op caveat applies – in that co-op games are only going to be as good as the people you play them with. I played exclusively with friends and have had a whale of a time so far, which is why I’m wholeheartedly recommending the game if you too have a group of like-minded comrades; for the most part it’s a really smart fusion of L4D with fantasy melee combat, which makes it the best co-op experience I’ve had since Payday 2. The more I hear about this the more I want to play it. I especially like that it’s four-player but has five classes. Can there be duplicates? I’ll probably wait until the PS4 release next year, as I have a larger pool of friends to play with on that platform. Hopefully the loot tables will be adjusted by then. No duplicates, no – and you may be wise to wait for the PS4 release. I think it’ll work particularly well on a console and with an additional few months of balancing and polishing the loot metagame could evolve into something a lot meatier. I’ve played the heck out of Vermintide as well and am still enjoying the game a lot. There’s a point on the horizon already though which is getting closer the more missions me and my friends complete on hard. After a couple dozen times each mission wears it’s charms down a lot. You develop a feeling for the optimal route through the level, discovered pretty much every chest and made it through the level with all tomes and all grimoires successfully and then there’s just higher difficulty at the moment which is not something that motivates me enough. This point hasn’t quite come yet though so fingers crossed that I’ll have another fun 20 hours with the game. Something that I start to dislike more and more is the loot system though. The randomness is just too high in my opinion and even the added chances for tome and grimoire dice often don’t seem to do very much. The mean of all my rolls has to be around 2 successes or something as often as I’m rolling that number. I actually wrote down the last 5 rolls and never had above 3 successes even though we had tons of bonus dice every time. On top of that, as you mention above, you’ll get stuff for a class you never play or stuff that you never use because it doesn’t suit your style of play which makes it even harder to get decent loot. I’m getting a bit annoyed by my bad luck at the moment and even my friends seem to suffer the same fate with rolls that seldom reflect the amount of bonus dice we collected during the level. Totally agreed. I’m genuinely a little surprised they didn’t randomise the Tome spawns, as that would have meant an optimal route would have come at the cost of a worse loot roll at the end of the game. The loot system is Vermintide’s greatest strength and its biggest weakness all rolled into one. Right now it is (or was) too far on the side of RNG-driven grind; I’ve not been back to it in a week but I saw Fatshark were making some additions to try and reduce that somewhat, so hopefully they’ll bring it back to somewhere where a run on a higher difficulty level feels worthwhile since you know it’ll provide something you can use.